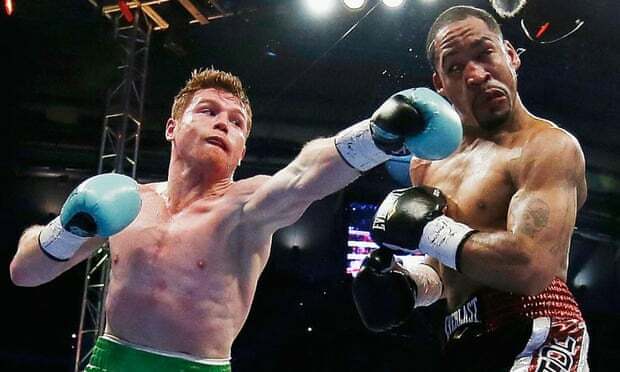 Former WBA/WBC light middleweight champion Saul “Canelo” Alvarez (45-1-1, 32 KOs) knocked out American James Kirkland (32-2, 28 KOs) in the third round on Saturday night at Minute Maid Park in Houston, Texas. The Mexican star dropped Kirkland three times in a thrilling slugfest before the referee stopped the bout. In the opening round, Kirkland came out firing, backing Canelo in a corner and landing blows. But Canelo withstood the onslaught and soon landed his heavy shots, dropping Kirkland with a powerful straight right hand. Kirkland was hurt but somehow survived the round as Canelo punished him with more hard shots. The American continued to fight hard but Canelo remained in control and nailed Kirkland with a right uppercut in the third round to drop him again. Kirkland bravely got up and tried to fight back until Canelo unloaded a thunderous right hook that laid him out as referee Jon Schorle waved off the fight at 2:19 of the round. Next Canelo will likely challenge WBC middleweight champion Miguel Cotto, if the Puerto Rican is successful in his first defence against former world champion Daniel Geale on June 6 at the Barclays Center in Brooklyn, New York.